UK expects to send tents and thousands of shelter kits to Mozambique tomorrow. UK aid is already supporting the humanitarian response on the ground through pre-positioned aid supplies and funding to international aid organisations. 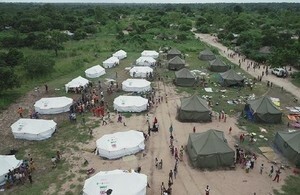 The UK expects to send up to 100 tents and up to 7,550 tents to Mozambique tomorrow (19 March). This is based on DFID’s ability to transport the items and assessment of needs on the ground. This could change as the situation on the ground evolves.